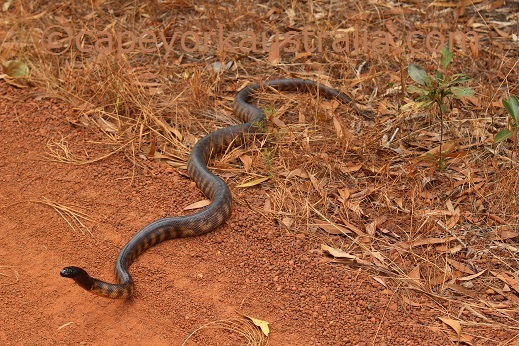 There are many Australian pythons in Cape York. Pythons are beautiful, large non venomous snakes. 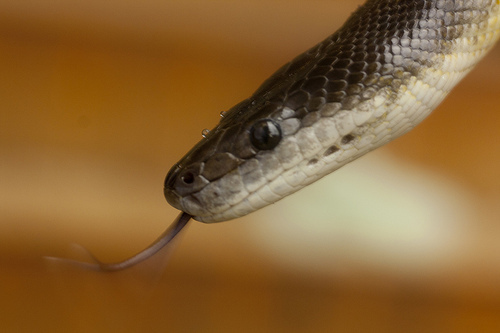 They may give you a bite that may get badly infected and take time to heal, but unlike poisonous snakes, pythons inject no venom into their bites. Below are the species we have in Cape York. 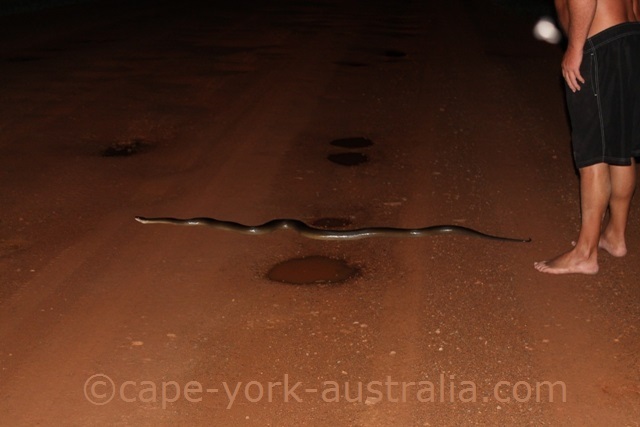 This is the most common of all Australian pythons, and probably the only one you will see on your Cape York trip, unless you go spotlighting night time. It has a very distinctive black head, and it is often active, crossing tracks and roads during the day time. A less common of Australian pythons to see, this is a small snake with dark brown dots and lines on cream coloured background. It can live in wet forests as well as dry woodlands, and it likes to hide in rocky outcrops, particularly if they have caves and crevices where bats live. Larger than the spotted python, this beautiful Australian python is also nocturnal and not so common to see. It is not always associated with water, but it will flee to water (if the water is available) when threatened. It hides in vegetation, on river banks and in hollow logs. There are many species of carpet python, but the one we have in up here in the tropical north Queensland is the jungle carpet python Morelia spilota cheynei. They are found in tropical rainforests in the south eastern, and also in the south of the peninsula including Atherton Tablelands. This is a large one - the second largest snake in Australia, and it is only found in western Cape York (it is more common in the Top End of Northern Territory and the Kimberleys in Western Australia). It has olive skin with no pattern and it prefers rocky areas near water. 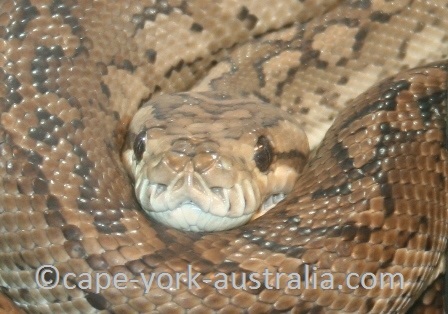 The largest snake in Australia, amethystine aka scrub python can grow up to eight metres long. It prefers rainforests and moist habitat, where it is often up in trees but can also be seen on the ground. It is active during the night time and possible to see when spotlighting. The most special one, found only in the eastern rainforests of Cape York (Iron Range National Park) and Papua New Guinea, the green tree python is possible to spot about a metre above the ground night time. 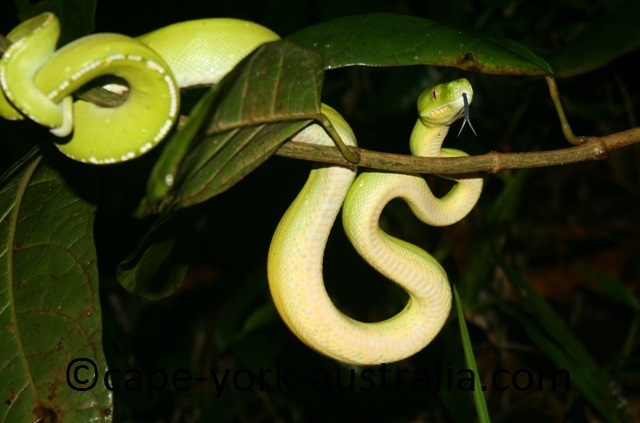 It is not the green tree snake, which is found elsewhere in Australia. 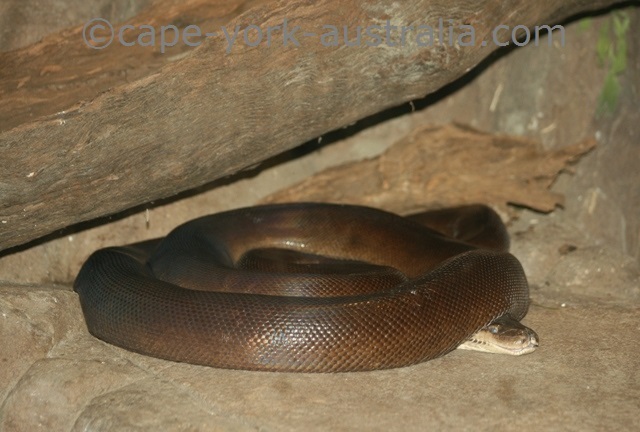 Olive Python is the second largest snake in Australia. It is found in the most of the tropical northern Australia, including the Kimberley and the Top End of Northern Territory, but in Cape York it is only found in the very west and north, in the areas like Kowanyama, Pormpuraaw, Weipa, Aurukun, Mapoon, as well as the tip of Cape York peninsula. As opposed to many other pythons, it has a smooth skin with no particular colour pattern, other than a paler belly and a darker back. It can look similar to the highly poisonous king brown and is sometimes mistaken for it, although it is a harmless snake. 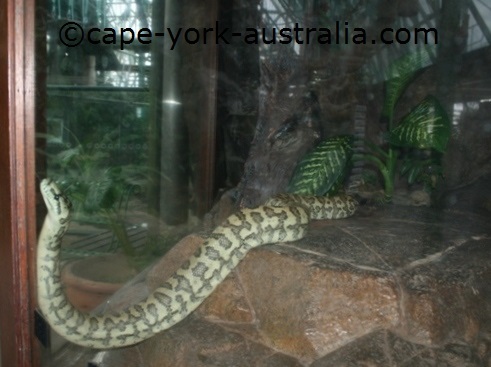 Second largest after amethystine python, olive python grows up to four metres long but is more often about three. Like its name indicates, it often has some olive green shades, although its main colour often ranges from reddish to chocolate brown. The belly is usually cream. Like all pythons it is a non venomous snake, totally harmless to humans. 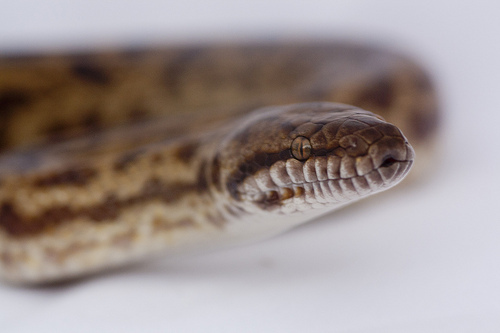 There are two subspecies of olive python that are geographically isolated from each other. Liasis olivaceus barroni is found in a smaller pocket in Pilbara region in Western Australia, while the more common Liasis olivaceus olivaceus is found all the way from the Kimberley region in the west, through the Top End of Northern Territory and western Queensland in the east. In Cape York, it is only found along the western coast of the peninsula. It lives in tropical savannah woodlands, and particularly prefers dry rocky areas, near water courses, like gorges, where it likes to hunt and swim. It is mostly nocturnal and often shelters during the day time in rock crevices, caves, burrows, hollow logs and termite mounds. 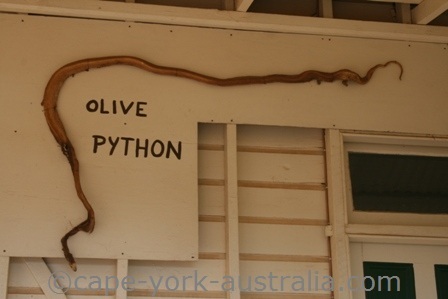 Olive pythons generally eat small mammals, birds, and other reptiles, but are also known to take prey as large as rock wallabies and monitor lizards. At gorges and waterholes they can use the hunting technique of a crocodile, waiting for animals coming for a drink and then striking from under the water. Like other pythons, they do not have poison, and they kill their prey by suffocating. Mating occurs during the cooler Dry Season months from May to July. About 20 eggs are laid 2-3 months after mating. After almost two months of incubation, the eggs hatch and the hatchlings emerge.